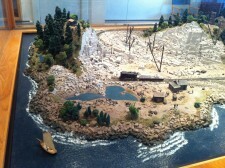 Stonington, Maine’s Deer Isle Granite Museum features a unique working model of the granite quarry on nearby Crotch Island, as it was operated in the early 1900s. Watch the boats steam across the Deer Isle Thorofare, listen to the seagulls and to the steam-powered trains chugging through the quarry, hold your breath while the derricks load swinging slabs of granite onto the ships. And don’t miss the explosion when the quarry bed is detonated. The museum is open every day in July and August, except Wednesdays and Fridays, from 12 noon to 5 PM. Although it is tiny, the museum is a can’t-miss experience if you are visiting the picturesque fishing village of Stonington on the Maine coast. 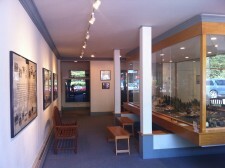 The museum is located in the old Webb Building on Main Street and easy to find as you enter town via Route 15. The museum’s exhibits celebrate the skill and bravery of Stonington’s quarrymen, as well as the fascinating history of the Deer Isle granite industry. The quarriers’ risky work cut the distinctive pink granite used in such 20th century monuments as New York’s Rockefeller Center, approaches to the Manhattan and George Washington Bridges and the John F. Kennedy Memorial in Arlington National Cemetery. No admission charge but contributions are welcome and appreciated. 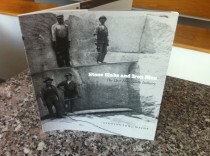 Buy this fascinating history of the Deer Isle Granite Industry at the museum shop - $10.